THE SEASON IS HERE!! 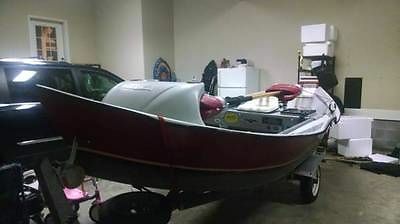 NEW 10' MINI DRIFTER DRIFT BOAT. BUILT TO ORDER. CUSTOM BUILT AND HAND MADE ONE AT A TIME, UTILIZING LIGHTWEIGHT 5052 AND 6061 ALUMINUM. 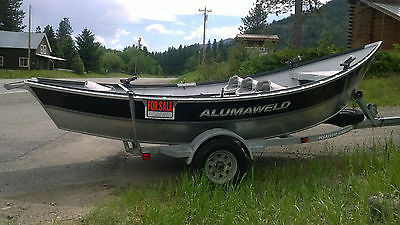 (Pricing is for bare aluminum finished boat only.) THE ULTIMATE IS SMALL BOAT VERSATILITY AND FISHABILITY! THIS 1 OR 2 PERSON DRIFT BOAT CAN EASILY BE LAUNCHED ANYWHERE. NO LAUNCH RAMP OR DESIGNATED ACCESS AREAS NEEDED FOR THIS FISHING PLATFORM. THE MINI DRIFTER CAN EASILY BE HANDLED AND DRAGGED TO YOUR FAVORITE SPOT EFFORTLESSLY. SLIDES INTO THE BACK OF A TRUCK, OR CAN BE CAR TOPPED! VERY STABLE AND HANDLES LIKE A DREAM. ONLY 125LBS.!!! I TOOK OVER MANUFACTURING OF THESE VERY VERSATILE BOATS, AND HAVE FISHED OUT OF THEM SINCE 1990. FISHING MOST OF THE RIVERS AND STREAMS IN MONTANA, CALIFORNIA, NEW MEXICO. FISHING FOR STEELHEAD, SALMON AND TROUT. ALSO FISHES PERFECTLY IN BAYS, LAKES, PONDS, AND LAGOONS. I PERSONALLY FISH THE MANGROVES IN BAJA AND EVEN THE SEA OF CORTEZ, CATCHING DORADO, TUNA, GROUPER AND MANY OTHER SPECIES. THEY WORK GREAT WITH A 2HP OR ELECTRIC MOTOR! PAINTING, POWDER COATING, OUTDOOR CARPET FLOOR, EPOXY GRAPHITE BOTTOM COATING ARE ALL OPTIONAL. IF INTERESTED, CONTACT FOR SPECIAL PRICING. BUYER PAYS ACTUAL SHIPPING COSTS AND $50 FOR THE 8' X 4' PALLET. FOR MORE INFORMATION, VISIT MINIDRIFTER.C O M OR CALL ME DIRECTLY AT (619)222-0301. 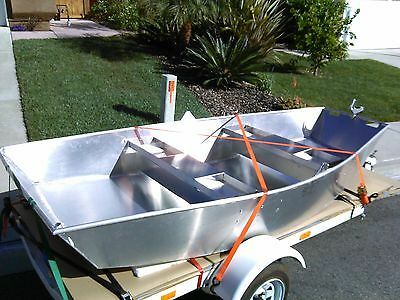 Included: Galvanized Trailer, 2 9' Sawyer Squaretop Oars with Shoal Cut blades, 2 9' Cataract Oars, One 2 piece Sawyer Spare Oar, Spike Anchor, Floor Anchor System with EZ pull pully system, motor mount, rowers bench with storage, Goop Coat It (kevlar/graphite epoxy) on hull and chines. No leaks, boat tracks and rows great.